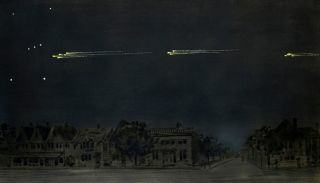 ﻿﻿﻿This painting by artist and amateur astronomer Gustav Hahn depicts the meteor procession of Feb. 9, 1923 as observed in High Park, Toronto. Hahn estimated that the fireballs passed about halfway between Rigel and the Belt of Orion. It may be the ultimate cosmic cold case, but the 100-year-old mystery of a huge group of fireballs flying in formation through Earth's atmosphere is finally a bit closer to being solved, scientists say. By sifting through the archival records from the meteor procession that took place on Feb. 9, 1913, sleuthing stargazers pieced together the surprisingly large path of the rare astronomical event. From Canada to Brazil, observers watched as hundreds of meteors streaked across the sky, but this wasn't any ordinary annual meteor shower. Because these meteors were traveling nearly parallel to the surface of the Earth, each piece of space dust and rock stayed visible for about a minute as each burned up in Earth's atmosphere. The procession lasted for several minutes. "To most observers, the outstanding feature of the phenomenon was the slow, majestic motion of the bodies; and almost equally remarkable was the perfect formation which they retained," said Clarence Chant, a University of Toronto astronomer who observed the procession in 1913. The red dots mark locations where the meteor procession of February 9, 1913, was observed. The accounts from the ships at latitudes south of the S.S. Newlands were discovered during the preparation of this article. The ground track, projected onto the rotating Earth, deviates somewhat from a great circle, with the southern part of the track shifted several degrees to the west because of the rotation of the Earth during the time of flight from Canada to the shipping lanes below the equator. To travel so far around the curvature of the Earth, the members of the 1913 meteor procession apparently followed tracks similar to the gradual reentry of satellites in low Earth orbit. Right after the procession, scientists put out a call in the journal Nature to find as many firsthand accounts of the event as possible. Reports trickled in from ships and countries around the world, but the varied logs put the line of sight for the procession stretching around 2,400 miles (3,862 km), from Saskatchewan, Canada to Bermuda. A century later, two researchers decided to reopen the case and track down even more reports detailing the rain of fireballs. "We have seven new accounts from ships' meteorological log books that extend the track farther than ever before," Don Olson, an astronomer at Texas State University, said in a statement. "This is the most complete map for this phenomenon that's ever been compiled. The track now goes more than 7,000 miles — that's more than a quarter of the way around the world. That's an almost unbelievable meteor event!" The new findings are detailed in the February issue of Sky & Telescope magazine. These new findings come in the wake of a month full of space rocks making news. On Feb. 15, an asteroid half the size of a football field buzzed by the Earth and on the same day a meteor exploded over Russia, creating a devastating airburst that injured 1,200 people and damaged thousands of buildings in the city of Chelyabinsk.